ePublishing Knowledge BaseePublishing Knowledge BaseePublishing Knowledge Base Optimizing Articles, Posts, and Other Content (SEO)How do I use the SEO tool in the Article Manager and Blog Post Manager? In the Article Manager and the Blog Post Manager, you may edit the Browser Title, Meta Description and Meta Keywords in the SEO tool. 1. To access the SEO tool in either the Article or Blog Post Manager, click SEO under Edit. Zoom: To access the SEO tool in either the Article or Blog Post Manager, click SEO under Edit. 2. The Friendly URL, Browser Title, Meta Description and Meta Keywords will automatically populate but you may edit them. Zoom: The Friendly URL, Browser Title, Meta Description and Meta Keywords will automatically populate but you may edit them. The Friendly URL can be changed. Do not mistake this for a redirect. Instead, this is the search-friendly copy, generated from the headline, that appears in the URL along with the article or blog ID. The Browser Title appears at the top of the window and is based on the headline. You may update it. The Meta Description is generated from the start of the article or blog post. If this copy is not SEO-friendly, you may want to update it. 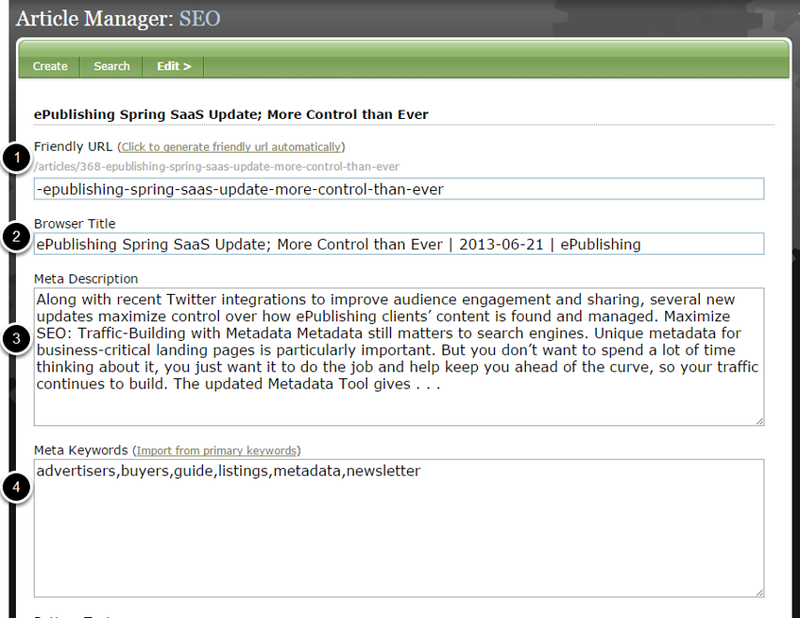 The Meta Keywords are created based on the keywords on the first page of the Article or Blog Post Manager. You may add them manually in this space, as well. 3. If you've made changes, click Save. Prev: How do I present recent articles by an author? Next: Search Engine Optimization. Help me understand it.